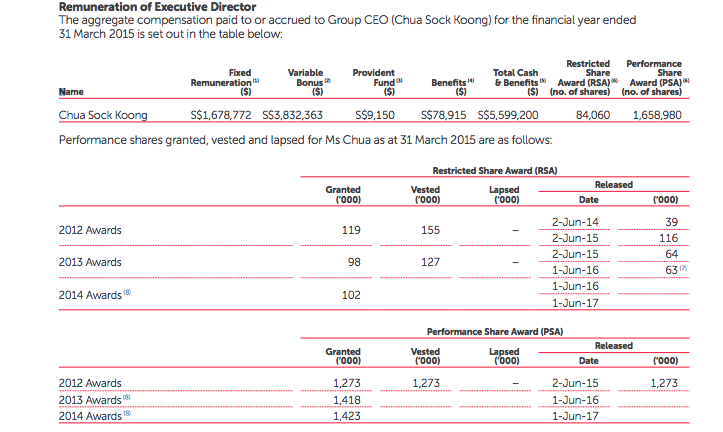 Many Singaporeans, particularly Singtel customers, at the pay raise given to Ms Chua Sock Koong, the CEO. Today Online, owned by fellow Temasek subsidiary, Mediacorp, reported that according to the 2015 annual report, her pay rose from $4.71 million for the year ending 31 March 2014 to $5.6 million for the current year. This consists of $1.68 million in base salary and $3.83 in variable bonus. “It is important to note that this bonus can be clawed back if Singtel does not continue to deliver sustainable value,” the telco said. It also said there is a “long-term incentive scheme in the form of performance shares to reinforce the delivery of long-term growth measured by total shareholder returns in relative and absolute terms,” Mr Israel said. However Israel was being disingenuous when he focused on the variable bonus element of Ms Chua’s compensation. Of course he wants Singaporeans to think that $5.6 million, huge sum that it must seem to ordinary Singaporeans on median incomes of about $40,000 a year if employers CPF is excluded, is all that Ms Chua is getting. He manages to mention only as an afterthought the long-term incentive scheme that the top management of Singtel enjoy. Yet this is worth at least as much and potentially substantially more than the fixed salary and variable bonus component. 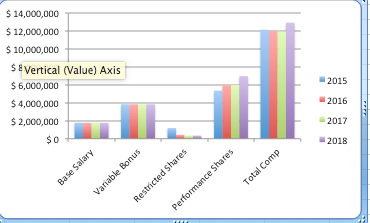 Unlike the other compensation it is driven purely by the relative and absolute share price performance. Most of Ms Chua’s share awards come from Performance Share Awards (PSA) for the top management. These vest over a three year cycle so shares awarded today will vest in 2018 subject to achieving her performance targets. 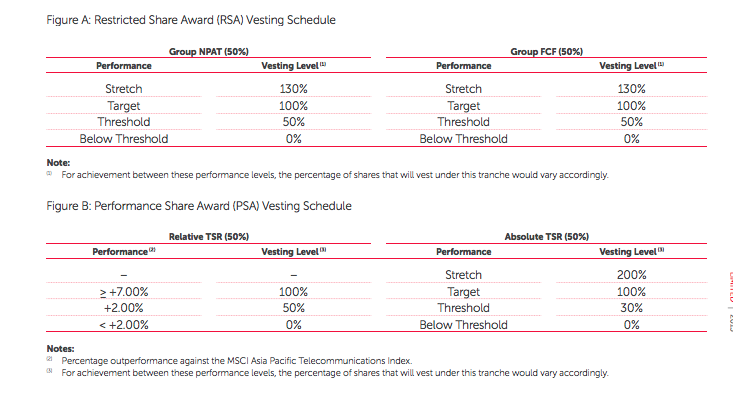 50% of the vesting is dependent on the Total Shareholder Return (TSR) relative to the MSCI Asia-Pacific Telecom Services Index (MSCI-APTSI) and 50% on the absolute TSR. For those of you who might not be familiar with the concept, TSR is share price gains (or losses) plus dividends and return of capital. Israel points out that Singtel’s TSR for this year’s award was 25% or 13% more than the MSCI so presumably Ms Chua could earn 50% more by the time the current award vests compared with the initial award. In 2015 Ms Chua had 1,273,000 shares vest from the 2012 PSA and 282,000 shares vest from the 2012 and 2013 Restricted Share Awards (RSA), which vest on a two year cycle. Thus the CEO’s total compensation was not just $5.6 million as Singtel and the State media would have you believe, but an eye watering total of more than $12 million based on the current share price of $4.20 of which more than 50%, or $6.5 million, comes from her share awards. Furthermore if the share price stays the same, she stands to receive at least $48 million in 2015-18 and possibly $58 million depending on the share price. This is because Ms Chua’s PSA is 50% determined by Relative TSR and 50% by Absolute TSR. On the Relative portion she is only able to earn 100% of the granted shares. However on the Absolute portion there is a “Stretch” band which allows her to earn 200%. The share price has risen by 25% in absolute terms this year so I assume she is likely to earn the extra shares come vesting time. 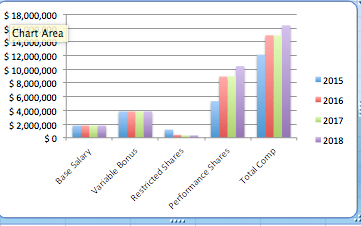 This is what her total compensation looks like assuming she earns no extra shares and that her Base Salary and Variable Bonus stay the same. I have omitted a figure for RSA for 2016 though it is likely that Ms Chua would get at least the same number of restricted shares (84,000) as this year. Of course this is probably an underestimate as Ms Chua is likely to continue to get PSA grants of the same number or greater shares in 2016-18. So to 2021 he total compensation could be of the order of at least another $39 to $48 million. Under the Stretch scenario this would take her total earnings over the period 2015-2021 to conservatively well over $100 million. Some readers may feel that there is nothing wrong with this. In a free market talent will go to the highest bidder and they will say Ms Chua has clearly demonstrated her talent. After all Singtel’s share price has appreciated by 25% in the past year. I am an economic liberal and believe generally in free markets though they may need government intervention from time to time to boost demand in situations like the current slow growth deflationary environment. I am not against financial rewards going to talent and innovation and to keeping tax rates low if possible. However how much is Singtel’s performance the result of Ms Chua’s talent. Though the share price has risen, this is part of a general rise in valuations globally due to quantitative easing and the search for any kind of safe yield. So how much has Ms Chua contributed to this and would Singtel have done just as well without her? Do Singaporeans need to pay her hundreds of millions of dollars to prevent her services from being bid away by another company? Also her tenure at Singtel has been extremely secure in contrast to CEOs in the US who, though they earn similarly outsize compensation packages, regularly lose their jobs if they fail to perform. Since she has been at Singtel since 1989. Her Wikipedia entry and biography in the annual report are maddeningly short of details on her career prior to 1989, when she joined Singtel’s Treasury. Yet since she was born in 1956 she must have worked for at least ten years before joining Singtel. Was she a public servant or a government scholar during this time? The fact that she serves on the Public Service Commission along with many other former senior civil servants, heads of State media, GLCs and the Singapore Land Authority as well as academics from State universities and lawyers with close ties to the PAP should tell us all we need to know. In any case Singtel’s business model and profitability is based on gouging Singaporean consumers and milking the cosy monopoly it enjoys with Starhub, another Temasek subsidiary, and M1, a Temasek affiliate through Keppel Corp’s significant stake. Singaporeans pay considerable more for mobile services and wifi than in other advanced countries like the UK or the US where the environment is much more competitive and the Government and the regulator do not have a conflict of interest because they own majority stakes in the leading players. Ms Chua has acted against the interests of Singapore consumers in fighting against net neutrality and to be allowed to charge extra to consumers using the services of new entrants, such as Whatsapp, which are disrupting and eroding the profitability of its business model. Last year she was involved in the Gushcloud scandal where Singtel was using an agency secretly to smear its major competitor, Starhub. However since both companies are Temasek subsidiaries and both enjoy a cosy monopoly it is difficult to get worked up about it. Ms Chua has failed to come up with new ways of creating value. It is difficult to see why Optus, in a mature and competitive market, needs to be part of the Singtel group or what value it adds which could not be achieved by spinning it off. Similarly she has probably overpaid in her recent purchases of US cybersecurity companies. As I have said before, the PAP Government’s ownership or control of most of the major domestic companies gives them huge powers of patronage and ability to buy loyalty to a system that does not serve ordinary Singaporeans well. Ms Chua’s 2015 compensation of over $12 million is more than 300 times Singaporeans’ median wage. Though this is in line with the ratio of US CEO’s salaries to their lowest paid employees, the process by which US CEOs are selected is much more competitive and the risk of losing your job much greater. Ms Chua is just a civil servant who runs a government-owned utility engaged in gouging the Singaporean consumer and who is obviously politically well-connected. Finally if the CEO of just one of her companies is earning hundreds of millions of dollars, how much is the Prime Minister’s wife, Ho Ching, being paid as head of Temasek? When will the Government answer this question? Do Singaporeans not have the right to know? Who, precisely, is Ms Chua Sock Koong? Someone with a relationship to someone who was or still is of special standing in the PAPy camp? My guess [and it’s only that] is that she is connected in some way to at least one [or several] member of the PAPy camp. This is how wealth is distributed among PAPy members.